Check out Surf Lodge Santa Cruz! Surf Lodge Santa Cruz is the perfect destination any surfer, from the seasoned veteran to the beginner, who is looking for a relaxed surf trip with great waves and great company. The camp has recently undergone a renovation with all the furniture in the communal area as well as in the bedrooms getting upgraded. At Santa Cruz Surf Lodge you also have a big pool, a manicured garden and terraced area to spend your afternoons and evenings relaxing. There is also a bar at the lodge so you can get a drink and swap stories with other guests about your best waves of the day. Another option is to spend the afternoon doing a yoga class to stretch and strengthen for the upcoming days of surfing. You can walk from Surf Lodge Santa Cruz to the next beach in 10 minutes, and if you take one of the bikes from camp you’ll get there in 3. To check the surf though you only need to step onto the terrace and look west. If you want to check out Santa Cruz you can also walk there, or take one of the free bikes from camp for a quick ride. Santa Cruz is an idyllic little coastal town filled with authentic Portuguese restaurants and little bars. Good food and drinks at unbeatable prices are super easy to find. The team and guests regularly go into town together for communal dinner trips and also to show you the best spots as well as some of the local delicacies. There are also a few shops scattered through town where you can buy souvenirs or surf gear. Another bonus is there is plenty of free parking at the lodge. You could think you are dreaming when exploring the coast around Santa Cruz with the abundance of perfect waves and empty line-ups. It’s no surprise that every year there are 5 major international contests here, and a lot of international surfers come to train as well. So if you want to see a pro surfer do their thing in the flesh, this is the place. The way the coast is shaped means if the swell is to small or the wind isn’t right in front of Surf Lodge Santa Cruz, you take a short drive to the other side of the peninsula and there’s bound to be better waves. And there are a crazy amount of spots to choose from. 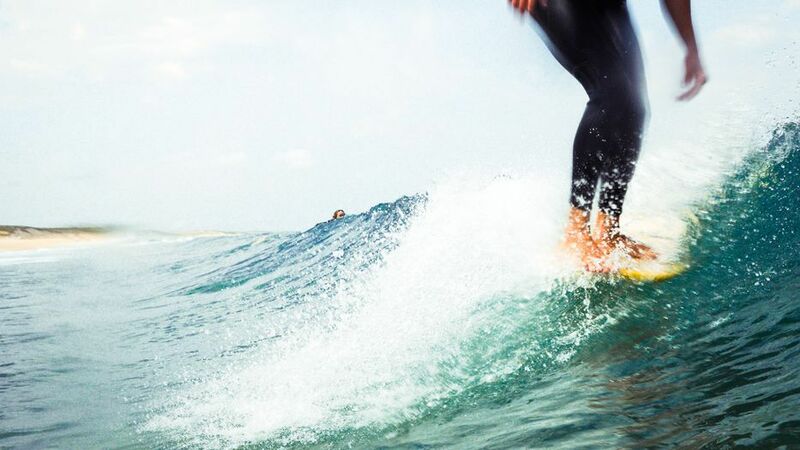 In between Ericeira and Peniche you have 30 recognised surf breaks. His real name is Andy, but everyone calls him Sonny. He’s a chilled and positive character from Italy, who also happens to be a pro Longboarder currently competing on the European circuit. When not competing or running the lodge he will come out and get you onto your first waves as a surf coach. Sonny completed the International Surf Associations Level 2 instructor program and is a qualified beach lifeguard. At Surf Lodge Santa Cruz there are two 4-person rooms, one with its own bathroom, and one that shares a bathroom with a twin single room across the hall. There is also one 6-person room that his its own bathroom. Everything in the rooms is newly renovated and freshly furnished including the beds and mattresses. The rooms also all have Wi-Fi and a sound system which you can connect your cellphone too. These rooms are perfect for travelling groups, solo travellers and those who are on a budget who don’t want to sacrifice comfort or great waves. Linen and towels are also included for all guests. There are rooms available with one double bed, which are perfect for couples, that come with the option of a private, or shared bathroom. There are also rooms available with two single beds that are ideal for friends, and again, come with the option of sharing a bathroom or having your own. All the rooms have been freshly renovated and furnished and each comes with a sound system that you can attach your cellphone too. Linen and towels are also included for all guests staying at Surf Lodge Santa Cruz. In the open plan living room there is a comfortable couch with a big flat screen TV where you can watch one of the surf movies from the camp, stream live surf contests, or look through the pictures that have been snapped by the team during the week. There’s also a small bar where you can get a drink, or snack, next to the dining area. Here you can meet, and socialise, with the other guests after your surf. Outside, you have a pool and big manicured garden if you want to spread yourself out and relax, swim, or read a book. Surf Course Santa Cruz film! Surf Lodge Santa Cruz prides itself on having the best surf courses that are run by experienced surfers in great waves. This surf course runs for 5 days, with 2 surf sessions per day, meaning you’ll be in the water from 3 to 4 hours per day. The first session everyday is more intensive with the coaches giving you lots of info and lots to try, where the second session is more of a free surf, with the coach there to give you pointers and take some video. There will also be 2 theory lessons back in the hostel as well as some video coaching. The Surf Course also caters to children as young as 9. If you are travelling with children under 9, no problem, just let us know, and for a small surcharge we can get the youngsters learning to surf as well. *During peak season: Booking a surf course is mandatory and if travelling with a family, or group of 8 or more people, at least 50% have to book a surf course. If you choose the surf guiding option you can surf as much as you want, or can, in a week. There is a minimum of 10 sessions. During 3 of these sessions the guides will get the camera out so they can do some video coaching back at the lodge. The surf guides will drive you to the best spots, sometimes going as far south as Caparica (1 hour) or as far north as Ferrel (40minutes) to find the best waves. If your skill level and the conditions line up they may even take you to Peniche or Ericeira. Surf guiding is only available in the low season. During surf courses or surf guiding, the equipment is included. 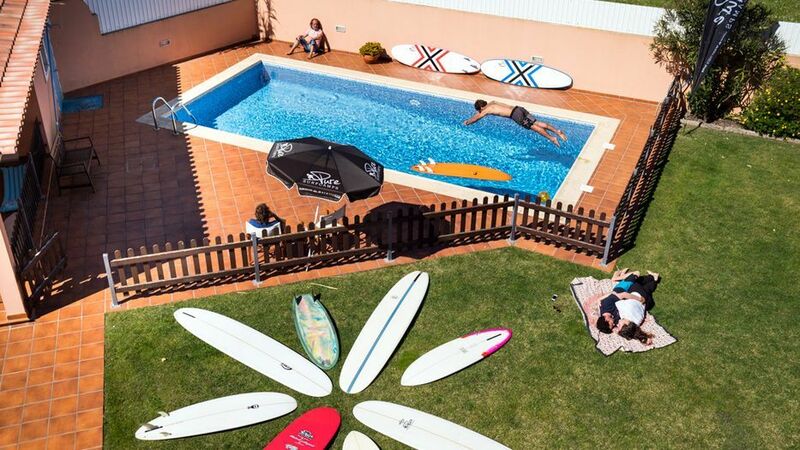 If you come in the low season however, you can also rent gear and surf at your own leisure. Santa Cruz surf Lodge has a large selection of surfboards with varying shapes and sizes as well as a variety of wetsuits. The crew at the camp are all passionate, experienced surfers and can help you pick out the right board for your skill level, the type of waves you’ll be riding, and your size. There are longboards as well as high performance short boards available and even a few retro fish and alternative twin fins. If you know what you want, you can always contact the team before your arrival and they can put something aside for you. Board rental is only available in the low season for surfers with a minimum of 4 weeks surf experience that are 18 and over. With the massive number of surf spots in the area it's impossible not to find a wave that you’ll like. The beginners usually go down to the beach breaks at Praia Azul. Santa Cruz and Santa Rita with the surf school, but if the conditions aren’t right there are 30 other spots with 30 minutes from the camp. The surf coaches and team all know the intricacies of the coast so they will find the best waves regardless of the conditions. And with the two world famous surf regions of Peniche and Ericeira north and south of the camp as a backup, you know the chances of getting waves are extremely good. At Surf Lodge Santa Cruz you will awake to an amazing daily breakfast buffet. The crew source fresh local produce to get your day started right, and give you plenty of energy when you tackle the surf. Breakfast includes freshly brewed coffee and tea as well as an assortment of food including fresh bread, muesli and fresh fruit. On the night of your arrival dinner is included. If you want you can also book dinner for the next 4 nights. The meals get prepared freshly in the onsite kitchen and utilise fresh ingredients from the surrounding province. Every meal is accompanied with an aperitif, water, and one beer, wine or soft drink. Once a week the BBQ gets fired up and you get to watch the sunset behind the Atlantic Ocean while sitting next to the pool enjoying a freshly cooked meal. The price for four evenings dinner is 59€. Surfing and Yoga compliment one another perfectly by improving balance and core strength as well as improving the ability to control breathing and general flexibility. The yoga sessions at Surf Lodge Santa Cruz take place in the garden or inside either early in the morning or around sunset. 4 yoga sessions cost 55€ and a single class is 15€. The camp offers comfortable beach cruisers to use. You can go for a quick ride to town and see what’s happening in Santa Cruz, check your favourite surf spot early in the morning or just explore and enjoy the stunning landscape. On the long list of tours and day trips available from Surf Lodge Santa Cruz, a few favourites are the trip to Sintra, Obidos, Nazaré and going to check out the WSL Surf Contests. All these trips can be booked from the camp once you are there. Sintra is a small historical town that is recognised as a UNESCO World Heritage Site. Here you will see amazing castles, forts and palaces while learning about the history of Portugal, and Portuguese culture. The trip costs 20 €. Óbidos is a picturesque medieval village still enclosed in the original city wall. Once inside the fortifications you will find yourself inside a city once owned by the queen, which is immaculately kept and is filled with stunning small alleyways lined with white washed buildings and brightly coloured doors. There is also a spectacular church at its heart. A trip here costs 15€. Nazaré produces the biggest waves in the world holding the current world record for biggest wave surfed. When the swell picks up you will find big waves surfers from every corner of the planet jumping on flights to get there and you can watch them from a dramatic cliff top viewing area behind the lighthouse. The price for this trip depends on the amount of people going. The WSL comes to Peniche on the west coast of Portugal annually to finish the European leg of the tour. There is a WSL qualification series stop at Guincho and the Big Wave Tour also visits Nazaré. If there is a competition on during your stay the crew will definitely tell you about it because they love showing the guests the pros surf and also enjoy watching themselves. The price again depends on how many people go. In the Low Season arrival and departure preferably on Saturday, but contact us if you would like to arrive or depart another day. *During peak season, booking a Surf Course Basic (15-Hours 229 €) is mandatory. If you are travelling with a family, or group of 8 or more people, at least 50% have to book a surf course. **Surf Guiding is only available in the Low Season. In the Peak Season, arrival and departure is always on Saturday. Shuttle services from Lisbon Airport, Torres Vedras or Ericeira Bus Station are one-way and the price is divided amongst passengers. Surf Lodge Santa Cruz offers Airport Transfers to Lisbon International (LIS), which take around 1 hour. The Surf Lodge team can also pick you up from the bus stations at Ericeira and Torres Vedra. In the car the trip to Santa Cruz Surf Lodge takes a little under an hour, whereas using public transport it can take up to 2.5 hours. Check the link for any further info. Torres Vedras is the closest major town on the way from Lisbon Airport to the Santa Cruz Surf Lodge, roughly 17 km away. To get here is quite easy. Once you arrive at Lisbon Airport head to the underground and get on the red line in the direction of San Sebastiao, once in Alameda get off the subway. Now you have to get on the green line towards Telheiras. Stay one the train until you get to Campo Grande. There you go to the bus stop and get on either the 701 or 702 to Torres Vedras. The trip takes around 45 minutes. Once you arrive in Torres Vedras you change on to any of the following busses to Santa Cruz, 703, 704, 728, all of which are heading to Barraquiero Oeste. Let the driver know you would like to get out at Avenida Joaquim Agostinho to get to the camp. If you decide to use public transpot, but would like to be picked up in Torres Vedras or Ericeira, let us know, and we can arrange someone to pick you up from the train/bus station. We recommend renting a car! In Portugal there are very cheap rental cars available that start from 80 € per week. At Sunny Cars you'll find the cheapest rental cars around! Getting a rental car will allow you to spontaneously explore the coastline or nearby Lisbon. It will also give you the freedom to take early morning drives up the coast to go to your favourite surf spot and be first in the water.